The Cornerstone of our digital advice platform is our pioneering work in the science of diversification. We believe that portfolio diversification is the crown jewel on the withering corpse of modern portfolio theory. Diversification is an active strategy and a powerful source of alpha. It works best when strategies have activity to capture price movements, whether this comes from active management or from rebalancing. Account dormancy is antagonistic to correct diversification implementation. More data, more measurement, more systemization With vast seas of financial data, superior sustainable investment performance must have roots in quantification and systematic process. The days of the stock picking gunslinger are over. Investors demand more. Process diversification can help portfolio diversification Diversification applies not just to the investments, but to the very process itself. 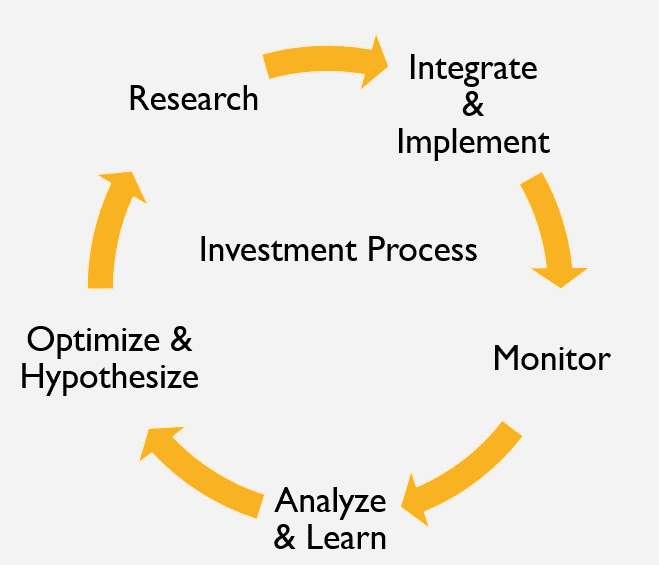 We regularly analyze our investment processes to search for undue sources of concentration, and seek to optimize. Diversification = systematically imposed Discipline. Fundamental and Value investing works.Fundamental investing and value investing are bedrocks of good security selection. Whether a stock or a bond is growth or value, estimating a fair market value or an expected return for that asset based on the company fundamentals is a sound approach. Value only means that the asset is mispriced, and could thus be purchased with the intent of selling later closer to fair market value. It is better to quantify more than less. – It is better to quantify more than less. Imagine you hire a Financial Advisor who makes a weekly decision to be 100% long the market or to be out of the market. He is quantifying one thing: the market for the next week. This is one dimensional and exposes investors to massive concentration risks (in this case it is the Advisor’s forecasting ability.) Whether forecasting weather, politics or investments the results are in and they are definitive. Measure more. Today weather forecasting accuracy is better than ever because they measure more things, in more places, more frequently. They measures so much data it takes supercomputers to process it. Or think about the presidential race of 2012. Campaigns are not run state by state, but by highly optimized down to the zip code. More measurement = more accuracy. In investments more accurate estimation = better performance and measuring more variables helps to maximize process diversification. Talent Exists. Talent in the investment management is much more prevalent than most give credit toward. That does not make it easy to spot, even if you look right at it. Creative investment strategies run by smart, disciplined and process driven people can be great sources of diversification to most any portfolio. We can help. Investors are human and humans make emotionally-charged, and often poor, decisions. The growing body of work, known as behavioral economics, sheds important light on this and investors behavior does not change rapidly. Systematic strategies can be built to capitalize on the market inefficiency caused by the behavioral fallabilities of investors making emotional decisions with incomplete information. Investment PhilosophyDiversification, like Gravity, is simultaneously both a very powerful and very feeble force. It is the omnipresence of each force that gives them their power. Just like architecting a building while ignoring gravity would probably fail, architecting an investment portfolio while ignoring diversification increases the chance of failure. Applying our knowledge of True Diversification® enables us to build portfolio that balance the diversification of systematic risks with the diversification of non-systematic risks. Investment strategies and indexes purporting to be well diversified because they hold large quantities of investments are typically wildly over exposed to systematic risks and thus out of balance, and subjecting its investors to additional risk. Portfolio Diversification is not a silver bullet, it cannot guarantee success. However, proper diversification is not only prudent we believe it can help performance. Managed properly, diversification could provide several extra percentage points to buy and hold strategies of the same assets. View Our Modern Portfolio Theory 2.0 Video to learn more.